On Stephens Island in New Zealand’s storm-wracked Cook Strait, the tuataraâ€”one of the most ancient reptile species on Earthâ€”is getting a hand from distinctly 21st-century science (see a New Zealand map). Researchers have placed in the wild a very special male that, like its wild cousins, can put on physical displays to establish its dominance. But this reptile’s skin is made of rubber, not scales, and its “heart” is a nickel-cadmium battery. The alpha male in question is “Robo-Ollie,” a robotic tuatara created to help researchers understand the behavior of these rare reptiles, the last species in a family that dates back 200 million years. 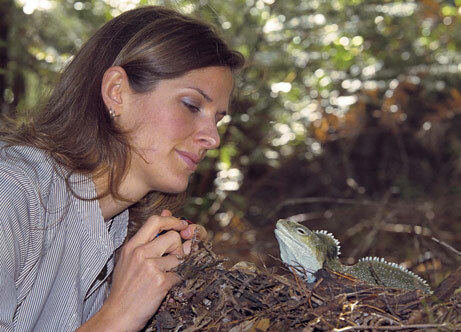 Specifically, postdoctoral student Jennifer Moore wants to know how male tuatara establish dominanceâ€”how they attract and keep females. Understanding critical behaviors could help tuatara translocation and captive-breeding programs, perhaps by guiding conservation managers to the genetically fittest, most productive males.